I don't know about you, but I'm always cold! I bought a crummy pair of boots last winter that didn't hold up through the season, and now I'm wishing I had invested in a pair of awesome Whooga ugg boots instead. The thermofleece lining would have been perfect for my icy toes! Fortunately for Haute Whimsy readers, Whooga is offering everyone here a 10% discount this week. If you're a Black Friday shopper like me, this is a super score! Just use 1009HAUTE at checkout. 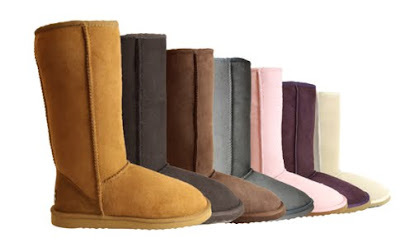 Also, Whooga is giving away a free pair of boots to one lucky fashionista! All you have to do is sign up for their free VIP newsletter and you'll be entered into their drawing. I signed up for the newsletter. Thanks for this post. This would be an awesome win for me.